I first heard about Hunnymilk a few months back from a work colleague and it caught my eye (and whet my appetite). An amazingly decadent brunch pop-up for a flat price, lots of food and a great locale?! What's not to want? 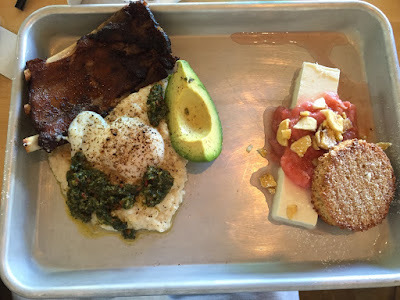 I finally had the chance to try it out with friends, Laura and Annie and we certainly weren't disappointed. 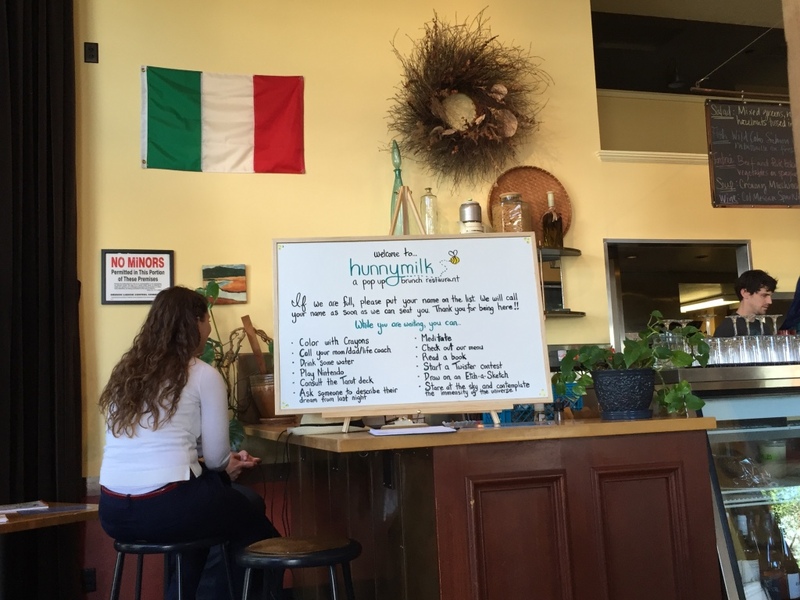 Located in the La Buca space on NE 28th near Burnside, Hunnymilk is set in a cheery, vibrant neighborhood that's pretty family friendly. Pop-ups are always a little dicey in terms of location, but Hunnymilk had nice clear signage that directed you right inside. Once we walked in, we were enveloped by the homey, welcoming atmosphere. While the dining area is pretty simple and essentially unchanged from its original host, there are little quirky touches that indicate you're in for a treat. First off, there's a fun little dry erase board giving you a list of things to do while you wait to be seated, meditation and playing Nintendo being among them. The actual dining room is nice and casual with varied seating arrangements for different sized parties. As I mentioned, the format is very conducive to family dining, which is especially interesting to me these days - and I noticed quite a few families with young kids (even babies!). They also give you these cool little coloring books while you dine, and my friends and I took the liberty to put together a little impromptu art piece. There's so much to say about the food, since it was all pretty stupendous and there was so much of it to boot. With our party of three, we were able to choose most things on the menu and then share them. An added bonus, thanks to Laura came in the form of free Monkey Bread just by signing up for their email newsletter. I highly recommend you do this, and you too can get a little something extra. Drinks - The first thing you do when perusing Hunnymilk's tantalizing menu is their drinks. 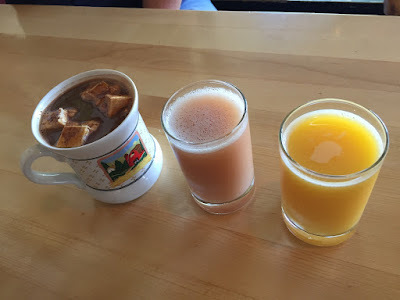 Sure they've got the traditional coffee, OJ and the like, but there are other fun options such as mango or guava juice and get this, caramel hot chocolate with toasted milk marshmallows. I couldn't possibly go with the latter knowing how much I'd consume in this meal, but my friend Annie went for the gold. I'm so glad she did, as I got to try her drink and fell into instant lust. It was creamy, rich, and reminded us of high quality drinking chocolate. Entrees + Desserts - After the drinks, came the fun part - choosing our food! Everything you get in Hunnymilk comes in these steel baking pans that hold all the goodness in. Both your entree and dessert comes on one tray so you've gotta think about them in tandem. The dessert was the easy part, as we chose one of each. Plus we got that killer Monkey Bread too I just mentioned. 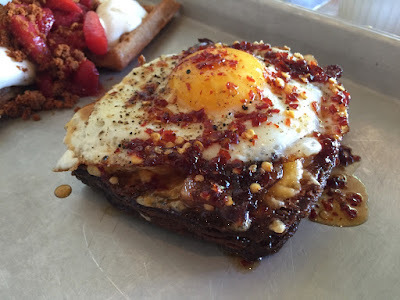 The highlights were many including Annie's open faced croissant/donut (aka Cronut, but not really) with a mix of savory and sweet ingredients including maple syrup, crispy bacon and a runny egg on top. It was so decadent and featured all the textures I love including crispy, runny, crumbly and everything in between. I went traditional with my crispy pork ribs on a bed of cheesy garlic grits, a slow poached egg and pieces of avocado on top. Actually the avocado was an innovative touch, as it relates to a rib dish but it worked well and added a little earthiness. I liked the little baby backs that pulled apart nicely and the meat fell right off the bone, tasting delicious together with the tangy grits. In terms of the sweet stuff, there was lots and lots of it. I'm known to have a big sweet tooth so I pretty much devoured everything, but I have to be honest in saying that I think I overdid it a bit. But as they say, you eat with your eyes first and I just couldn't resist. 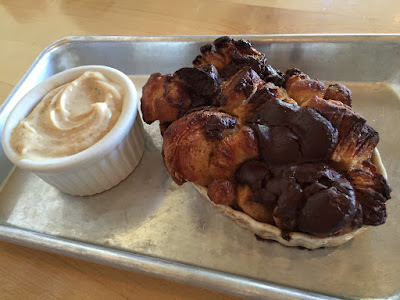 Two faves that stood out were the (free) chocolate monkey bread that pulled apart easily and dipped oh so nicely into the velvety peanut butter mousse. It really was the perfect thing to break apart and enjoy as a group, making this a social dessert. The other fave was ironically the item that looked to be the least decadent - a beautifully shaped Greek yogurt mold topped with rhubarb compote and a crunchy shortbread cookie on top. The latter was all sorts of buttery, crumbly and delicious. It had the right texture to break apart and dip into the yogurt rhubarb concoction. On occasion, I've experienced that Portland's creative eateries can have quite a poor service component but luckily this wasn't the case at Hunnymilk. We loved our waitress who was friendly, cheery and knew the menu well. After learning a bit more about Hunnymilk's staff, I found out her name is Alex, she's a writer/editor and also girlfriend of Hunnymilk's founder, Brandon. Like I said, it's a tightly knit crew. They know their customers and treat them well. You'll pay a $20 flat fee for brunch which includes everything I described except the tip of course. Sure it may be a bit higher than your traditional Portland brunch, but it's the bees knees (and then some).